Important stuff doesn't always happen when you’re conveniently sitting at your desk. Maybe you're out to dinner when your boss tells you that she needs the latest project proposal ASAP, or your daughter calls you on your commute home to ask you to proofread her college essay (that’s of course due that night!). While we can't make your life more predictable, today's update to the Gmail iOS app, along with earlier updates to the Gmail Android app, makes it easier to get stuff done on-the-go. 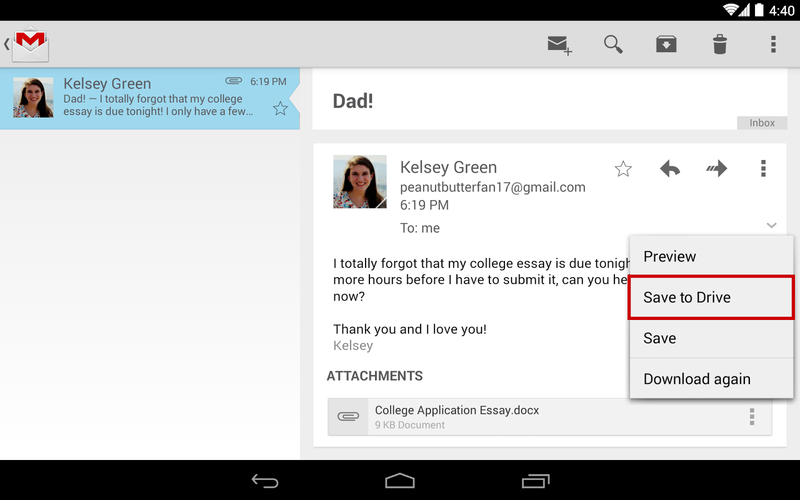 Just like with Gmail on the web, you can now insert files from Google Drive directly into an email on your phone or tablet. The apps will even tell you if your file isn’t shared with the person you’re sending it to so you can change the sharing settings before you send it. And to help you store all your files in a single place, if someone sends you an email attachment, you can save it directly to Drive with one tap. On iOS, you can now also change your profile picture right from your Settings. So the next time you take that perfect selfie, you can make it your profile picture right away, all while out with friends. Lastly, if you have multiple Gmail accounts, you can choose which signed-in accounts you want visible in the app. You can give these features a try by downloading the updated Gmail iOS app from the App Store, and if you’re using an Android phone or tablet, you can get the latest version of the Gmail Android app from the Google Play Store.